Bilge Stringers, Notes on Fitting. Bilge stringers are used in many carvel and other round bilged hull shapes to add strength and stiffness. While smaller boats don't really need them, workboats, powerboats and others that are likely to be highly stressed often have one or more, on each side of their hull. However, hard chined hulls already have sufficient structural strength because of the chines. Stringers while giving general stiffness to the hull can also provide valuable support should she be unfortunate enough to go aground and lay over on her side. The strength comes from the box section that is formed between the stringer, frame and planks. The same process is often used to strengthen and stiffen the gunwales on wooden dinghies. 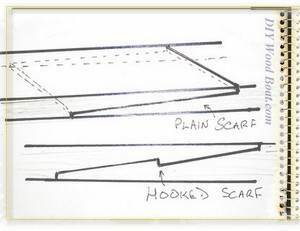 Similar strength can be achieved by adding 'ceiling' planks within the hull, while this might be advantageous in some situations, it does make getting to the inside of the skin planking impossible. One stringer each side is the norm for most leisure boats however, there are circumstances where several lighter stringers might be the better option. Boats which regularly take to the ground would benefit from an extra stringer between the standard bilge stringer and her keel, as would workboats and heavy offshore cruisers. However, boats which are diagonally strapped shouldn't require these added stringers and cold-moulded hulls will already have the longitudinal stringers over which the planking veneers are laid. Dimensions and Fitting Bilge Stringers. 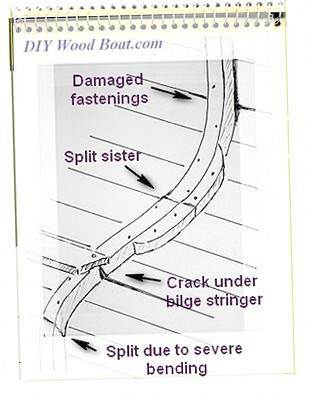 A large single stringer which is out of proportion to the frames and planks can be a cause of damage to the underlying frames. If the stringer is too stiff to flex with the rest of the boat it will put a great deal of stress on the part of the frame it is attached to. 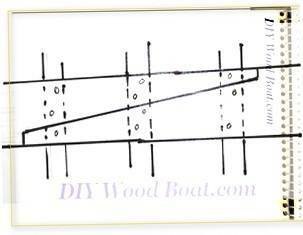 Ideally the thickness of the strake should be somewhere between the thickness of the plank and the frame size. Where additional strength and stiffness is required it is best to use several smaller ones and with smaller fastenings. Also because of the danger of frame failure it is important to shape the back of the stringer so it fits to the curve of the frame. If the back of the stringer is left square the corners will bear on only a very small area of the frame. Where they have to be installed using several pieces or shorter lengths, these can be scarffed, which is how I did the Mignonne's. However they can be joined with long nibbed joints, which is a quite common method used on work boats.